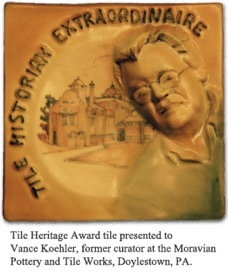 Founded in July 1987 Tile Heritage celebrates its 26th anniversary this year. Supporters like YOU... members, major contributors, industry sponsors, generous grantors... everyone... have made possible the continued fulfillment of the Foundation’s mission to Document and Preserve tile history in the U.S., both past and present. THANK YOU! Comments about E-News? Share them for posting!